UC Santa Cruz students who may be temporarily short on cash for meals or have ongoing needs related to food security now have multiple support options on campus, thanks in large part to funding provided by the UC Global Food Initiative, and the efforts of the Food Systems Working Group (FSWG), the Center for Agroecology & Sustainable Food System (CASFS), the Dean of Student’s Slug Support program, and the Blum Center. The need for this support has never been greater. A recent survey by the UC Agriculture and Natural Resources Nutrition Policy Institute found that four in 10 UC students are food insecure, reflecting the rising cost of college and a challenging financial climate for many students. With both World Food day, Oct. 16, and National Food Monday, Oct. 24, the campus Food Access and Basic Needs Committee is focused on ensuring students know resources are available to them, and that they’re not alone in their efforts to cover the costs of attendance. “It’s a struggle facing college students around the state and across the U.S.," said Tim Galarneau of CASFS, who co-chairs UC’s GFI Food Access and Security Subcommittee. At Hahn Student Services on campus, students this year will find a much-expanded version of the former “snack closet.” “The student food pantry is now registered as a food distribution center with Second Harvest Food Bank,” Galarneau said. The food pantry, located on Hahn’s second floor and now open 9 a.m.–5 p.m. weekdays and by appointment, features a new cold storage unit purchased with GFI funds where students can pick up perishable items and fresh, organic produce, along with dry goods and some toiletry items. From organic potatoes grown by students for students on the UC Santa Cruz Farm to dried beans, soups, and non-food items, such as deodorant and shampoo, there are items to nourish and support students. Judy Xie, a 2015-2016 GFI Fellow and FSWG student leader, helped expand the Swipes Program to the UCSC campus as another option for students facing food budget challenges. Initiated at UCLA, the program lets students donate their unused meal plan dollars to Slug Support. “Students who don’t have meal plans can have the funds added to their student IDs,” explains Xie. “They can use them at the dining halls and there’s no special voucher or anything you have to present, so there’s no stigma attached.” Colleges, Housing and Educational Services (CHES) Vice Chancellor Sue Matthews, and UCSC Dining Services Director Bill Prime worked with Judy Xie and Slug Support to ensure the software and program success is prioritized. The popular organic produce “Pop-Up” is also open for business again. Run by FSWG interns who team with CASFS staff from the UCSC Farm, this weekly produce stand operates noon–4 p.m. Wednesdays in Quarry Plaza. The Pop-Up offers organically grown produce from the UCSC Farm and other local, organic farms. Produce not sold that day goes to help stock the shelves in the student food pantry at Hahn. 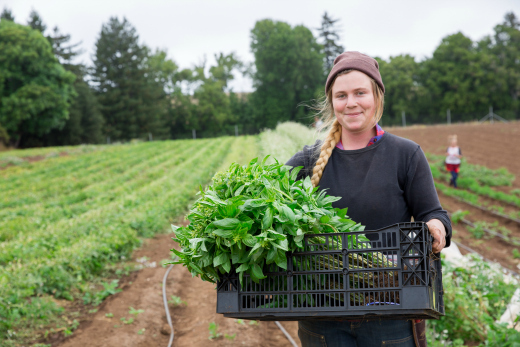 Galarneau explained that the UCSC Farm will soon add two “high tunnels” (greenhouse-like structures to cover some of the farm beds) to expand year-round production for the Pop-Up and food pantry, as well as the campus dining halls. “The high tunnels would allow us to grow a number of crops all winter long, including cooking greens such as bok choy and tatsoi to dino kale and salad mix,” said farm production manager Kirstin Yogg Comerchero. Slug Support is also working to sign up students who qualify for the CalFresh program, which provides SNAP/EBT benefits (formerly known as food stamps). “CalFresh is a much underused program in California, in part because a lot of people aren’t aware they qualify,” said Mario Gonzalez, Slug Support staff and recent UCSC graduate who explains that the benefits don’t affect a student’s financial aid or award package. Qualified students can get up to $200 a month to use at local farmers’ markets and grocery stores. “At the weekly Pop-Up, you can double your purchasing power using SNAP as we offer $10 in matching funds when a student uses $10 of their CalFresh allotment, ” Galarneau said. Any students seeking access to the food pantry, Swipes program, CalFresh, and other efforts can sign up at the Slug Support office at Hahn Student Services. In the past year, 3,000–4,000 students used the Slug Support system for everything from the food pantry to gift cards at local grocery stores. That includes FSWG interns working at the food pantry to get feedback from users and refine the offerings, teaching free workshops about budgeting and meal preparation, and running the Pop-Up program and outreach. Second-year student, Diane Villalba works with a team of interns that is working with staff and faculty to advance efforts to improve services and support for their peers. “Its important that we can work together to make a difference and ensure students know the resources they have to succeed,” Villalba said.